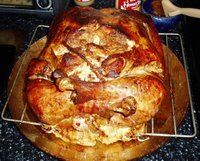 The World of AF Grant: Happy Turducken Day! Hope everyone enjoyed Thanksgiving this year. We dared to break from our recent tradition of frying our turkey to finally sample a Turducken. For those who don't know; a Turducken is a semi-boneless turkey (it just has wings and drumsticks) that is stuffed with a deboned chicken that is stuffed with a deboned duck breast. A layer of Cajun dressing is placed in between each bird to create six flavorful layers of stuffing and poultry. Normally we've talked about trying a turducken while we clean up after Thanksgiving, but this year we remembered to look into it in plenty of time to order one from CajunGrocer.com. No, we didn't make one from scratch - perhaps next year. The Turducken is very deceiving, it looks too small to feed as many people as it is supposed to. But since it is boneless and crammed with so many things, it is just a solid brick of food. I was sure the 15 lb creature wouldn't be enough for our 14 guests but we didn't even get through half of it. 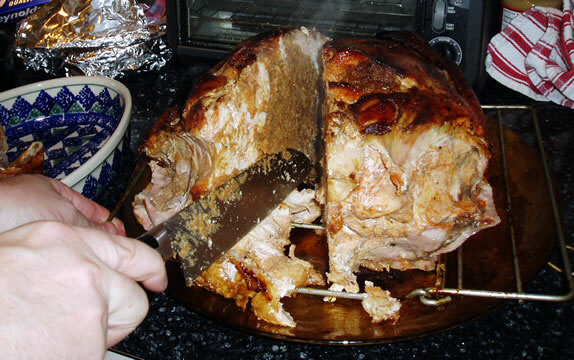 One of the coolest things about the Turducken is how easy it is to carve. You just cut it right down the middle and start cutting slices. Like it is some sort of poultry layer cake. And the combo of birds made the tastiest gravy ever. I highly recommend trying one. We've spent the last two days eating left overs, watching Curb Your Enthusiasm marathons and pulling things together for our big trip to Chile to raft the Futaleufu River and then check out Easter Island, which is now just a couple weeks away. We'll actually miss a few Patriots games, but with them blowing people away so easily I don't think we'll notice. I never would have guessed how boring it could feel to have such a dominant football team. Close games and cheering for the underdog (like the Pats were in their first Super Bowl win in 2001) is so much more exciting and gratifying. A Super Bowl win this year seems like it will be almost anticlimatic since the whole world already expects a perfect season and another championship. Never would have predicted the Patriots would become a hated jugernaut like this. 10 Years of Wedded Bliss!